As a catalog of titles, you will see a variety of genres and subjects. It’s organized by authors’ names. Several authors have many titles to their shelf. Most are Fiction, Fantasy, Horror, Romance, Sci-Fi, Historical, and Memoir — even a few Non-Fiction subjects appear. Each author has a link directly to their website or an affiliate site like Amazon.com. That’s where you can purchase or pre-order. This portal of books, its owner/operator, and affiliates are not directly responsible for orders, pre-orders, returns, errors in authors’ representations, or re-directs to erroneous websites. Every effort has been made to link to known and recommended authors and their titles. Highly recommended are author members of the High Desert branch of the California Writers Club in Apple Valley, CA. I know them and the level of quality speaks for itself. Many of the club’s authors have received awards and consideration for film projects. Let me know if a book has been removed from sales or not available until a print date is announced. 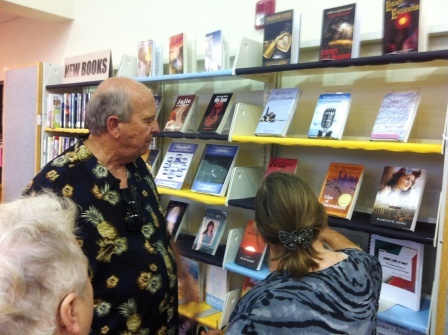 If you have a book for sale go to New Titles more details in placing your book on a shelf.